The Mix is a $90 million development that will offer flat-screen TVs and recording studios, among other amenities. It’s being marketed as affordable housing geared toward Georgia State students. Currently, The Mix is just some blue beams rising off the corners of Piedmont and Avenue John Wesley Dobbs Avenue. But by fall 2019, The Mix will be fully furnished. Officials expect 685 beds and 8,200 square feet of retail space. South City Partner developers, so far, have been slapping down new levels, not in weeks, but in days’ time. “The project is coming along well. We’re putting up a new level every four days, so it’s going up fast. It’s 26 stories total and we’ll be done pouring the top floor in December, so in a month it’ll be at its top level,” said Sean Rosko, South City Partners development manager. The Mix, however, is not affiliated with Georgia State. “Aside from being an official partner and sponsor of the Georgia State athletic program, we are not connected to the university at all. We’re a private development geared toward Georgia State students,” Rosko said. 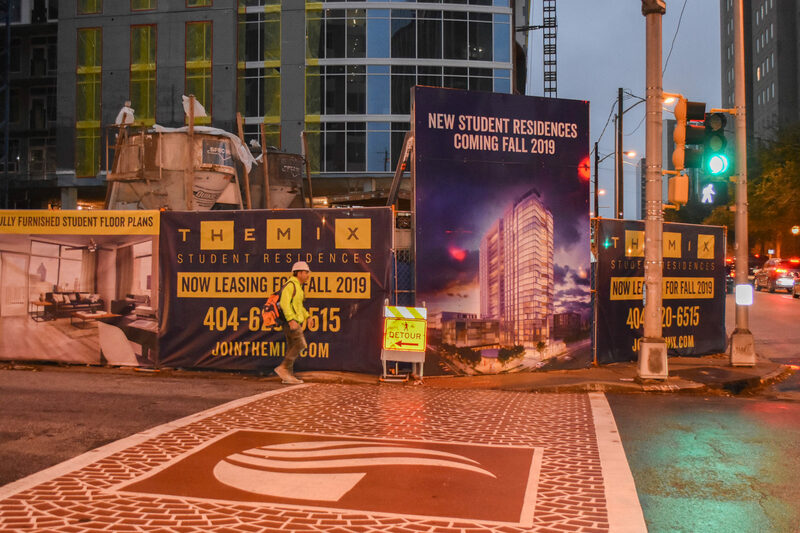 Non-students could live in The Mix if they chose to, yet South City Partners claimed similar projects, like Square on Fifth at Georgia Tech, housed only three to five percent of “graduates or recent graduates that were working in the Tech Square area,” the remainder being students. “Federally, we cannot regulate whether or not it’s just Georgia State students, but we’re marketed towards Georgia State students whether it be undergrad or graduates,” Rosko said. Amenities set The Mix apart from other student housing, but South City Partners still aims to keep it affordable. “[The Mix is] good budgeting and financial strategy on our part. Our bread and butter is providing the best experience possible for the students at each university,” Rosko said. “That’s kind of what we focus on: providing the best amenities out there at a reasonable price that’s comparable to whatever else is offered in the market. That’s why we’ve been successful,” Rosko said. The amenities, as Rosko said, “are pretty stout”: pool, rooftop luxuries, fire pits, cabanas, pool tables, shuffleboards, study rooms, music rooms, tanning salons, lounge areas, kitchens, grills, a fitness center, a yoga room and a dog walk area. Besides amenities for residents, The Mix also caters to pets. “[The Mix] is one of the only places downtown where you can take your pet outside and let them run around a little bit. We’ve got a dog run and we’ve also got a dog spa [free for resident use] on the first level,” Rosko said. Another facet to The Mix’s affordability: energy efficiency. Additionally, The Mix utilizes a more efficient water system, pumping through all 685 bedrooms. “We are using a boiler system which will feed all 685 beds in lieu of each apartment having a hot water heater. Boilers are substantially more efficient than individual hot water heaters,” Rosko said. South City Partners believes The Mix provides “peace of mind,” outweighing the “stout” amenities. “We’ve got state-of-the-art equipment, camera systems and access controls. I know [security has] been a problem in that market. We have everything to make it the safest living environment in the Georgia State market. We’ve got multiple levels of control as soon as you walk in the door,” Rosko said. Unlike Westmar and other private student housing, The Mix will not provide bus transportation due to its proximity to campus. “The Mix is directly across the street from Georgia State shuttle system and they have five shuttles that go through there all day long, so we will not provide transportation. It’s also within .4 miles to campus, so it’s definitely walking distance,” Rosko said. Single bedrooms value between $1,400 and $1,460 per month and costs decrease depending on the number of roommates a tenant has. Cheaper options list four-bedroom apartments: a $925 starting price with a $1,015 cap, per student renter. Yet, 200 Edgewood, nearby student housing competition on Edgewood Avenue, has The Mix beat at $1,049 for a two-bedroom apartment against The Mix’s $1,150 starting price. The Signal reached out to Westmar Lofts and One12 Courtland Apartments by phone to inquire if prices will change depending on The Mix’s arrival, but no answer was received. South City Developers remain optimistic about The Mix, where Georgia State students could live affordably while taking advantage of their offered amenities.